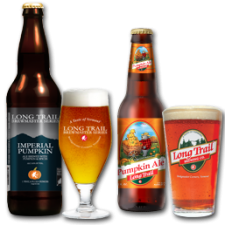 This fall, Long Trail introduces a new recipe, Long Trail Pumpkin Ale, a slightly sweet seasonal treat artfully brewed with pumpkins, cinnamon, ginger, nutmeg, and cloves. The perfect drink for a fall day, this exceptionally balanced beer has an aroma very reminiscent of pumpkin pie. It will be available in six packs of 12 ounce bottles and in the Long Trail Fall Survival 12-pack. Long Trail Imperial Pumpkin Ale is the latest introduction to the Long Trail Brewmaster Series. This limited release seasonal treat is small batch brewed with pumpkins, cinnamon, ginger, nutmeg, and cloves. It also features increased malt and hops and a higher alcohol content by volume (8%), and a rich and complex pumpkin flavor for the beer enthusiast. It will be available in 22 ounce bottles, five-gallon “logs,” and 50L (13.2) kegs.